Best-selling mystery novelist Peter Neal heads to Rome to promote his latest book Tenebrae. As is the case with all good horror films, a murderer is on the loose, committing atrocities inspired by Neal's newly published text. The writer sets out to solve the crime, with terrifying results. Tenebrae (Latin for "darkness") brought director Dario Argento back to his roots in the giallo genre. One of the most visually striking scenes in the movie is a death sequence in which the victim's arm is chopped off. A geyser of blood splatters a white wall like a gory painting. 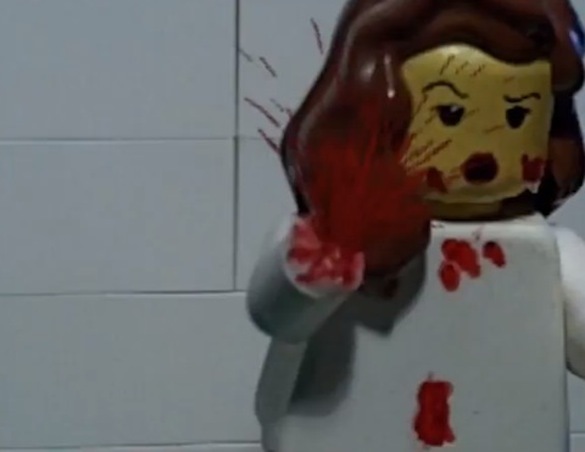 The gruesome scene inspired a LEGO enthusiast to re-create the bloodbath. We spotted the clip, which you can watch below, on Dangerous Minds. Will LEGO characters being chopped to bits and pieces ever cease being amusing? We hope not.